Our first 200 trial lavender plants were planted in September of 2001. We planted 40 each of Dentata, Allardii, Angustifolia `Twickel purple’, Intermedia `Super’ & `Grosso’ in September of that first year. In the October/November 2001 we had a modest harvest for our own use. We were very excited the plants had survived! A further 300 plants were purchased in March 2002 `Twickel Purple’, `Swampy’ and `Bee’ along with approximately 50 of our own cuttings. The day after planting these we received 6.5 inches of rain and 40 degree heat. We lost the majority of these plants from this wet weather as the ground stayed damp for a week or more. We sold this harvest as stripped product to a local business and we were very happy with the result. The Frosts in winter 2002 were extreme for the area and we lost all of our Dentata and a lot of Allardii however the intermedia and angustifolia varieties tolerated the conditions reasonably well. Another 800 angustifolia and intermedia lavender and 170 rosemary were planted in 2003. Another 1200 angustifolia and intermedia plants were planted in 2004. In 2004 our still was built to Matthew’s design by a local boilermaker. Our first distillation was done in November 2004 with wonderful results. One of our first distillation batches (Lavandula angustifolia ‘Swampy’) won first prize at the 2005 TALGA conference oil competition. At the 2006 TALGA conference oil competition the same variety Lavandula angustifolia ‘Swampy’ won 3rd prize. We were thrilled with both of these results. In 2007 our Lavandula angustifolia ‘Maillette’ won first prize at the TALGA conference. 2008 saw us once again win the annual lavender oil competition with our distillation of Lavandula angustifolia ‘Bee’. Continuous plantings throughout 2009, 2010 & 2011 will see our plantings cover approximately 1- 1 ½ hectares. These plantings currently include the following varieties – Lavandula angustifolia – ‘Bee’, ‘Maillette’, ‘Swampy’ Lavandula intermedia – ‘Riverina Thomas’, ‘Margaret Rocky Hall’, ‘Grosso’. 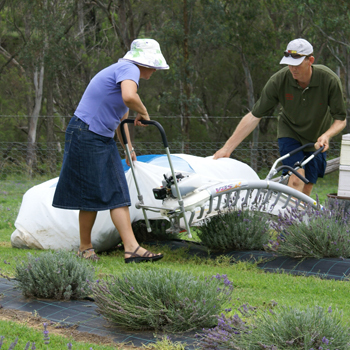 Currently (early 2013) we are going through a massive replanting and rearrange of our lavender plantings. This replanting is due to massive losses incurred from a combination of weather, age of plants and disease. However we are determined not to give up and are undertaking a fresh look at our farm layout and management. This is a work in progress and will be undertaken in the next 12 months. January 2014 – 1000 new plants are in. Intermedias are doing very well but angustifolias are suffering and we have had more losses. Days of 43 degrees has not helped the situation. We believe they are suffering from some sort of fungal disease so spraying, praying and pruning of these varieties and just maybe we can beat it. Our lavender flowers between October and March depending on the season sometimes later or earlier. Peak flowering/picking times are around Christmas week. Our oil flowers are harvested with an ‘Ochai’ harvester and our dried product is harvested by hand with a sickle. All of our essential oil is distilled on farm by Matthew in our still. Our ‘Shed Shop’ is open by appointment all year round. We welcome groups and have had many garden and bus groups enjoying morning tea and lunch along with distillation and picking demonstrations. We usually have a market stall at the Inglewood Show and various seasonal markets. We have been exhibitors at Bush Christmas in Toowoomba since 2007, Gourmet in Gundy since 2009 and Pittsworth Art & Craft Spectacular since 2010. In 2008 we held a ‘Bubbly Breakfast’ and Open Day in the Lavender. Our ‘Shed Shop’ is filled with lavender goodies ranging from our own lavender essential oil, lip balms, Strawberry & Lavender Jam, Leven K Mustard, heat pillows, lavender bags, soaps, body oils and our very popular Shona’s Lotion. We are also stockists for Gingerlilly Pjs and Cheeki Waterbottles. Our products are also available at various local businesses such as Goondiwindi Visitor Information centre. We have many regional returning customers who loyally seek out our products and we thank them for their loyalty. We continue to produce quality Lucerne Hay in small bales, along with our annual Lavender Harvest and always strive to produce QUALITY RATHER THAN QUANTITY. 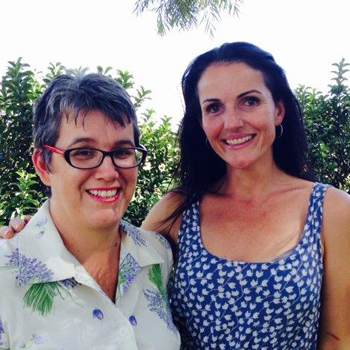 The lavender is a common interest for both of us which we feel can diversify our business to a new level. We are passionate about sharing our interest in Lavender and its uses. We have done all the planting, harvesting, weeding, stripping, distilling, crying, laughing and whingeing on our own with the help of Grace, Laurie and Hamish (our beautiful children). We enjoy attending the annual TALGA lavender conferences as often as we can, and feel that these are a valuable networking opportunity. Knowledge shared in a common interest is usually the best kind of education. If nothing else the enjoyment from growing such a beautiful plant is reward enough on its own.